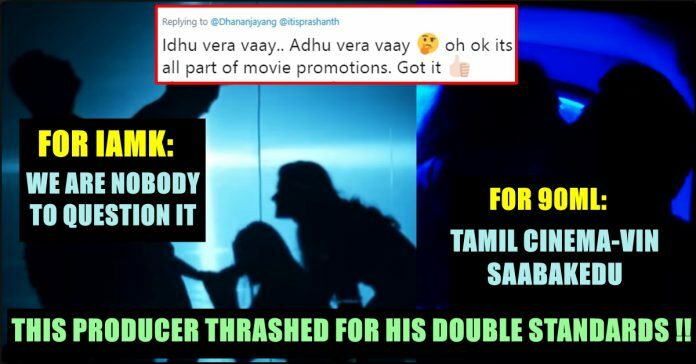 This Double Standard From This Tamil Producer Thrashed By Online Users !! Check Out !! G. Dhananjayan is an Indian film producer, Two Times National Award Winner, Columnist, Author of four books, Founder-Dean of BOFTA Film Institute.He was instrumental in producing a number of films in Tamil, Telugu, Malayalam and Hindi languages. The producer’s statement during two different Adult censored films is today’s most trolled subject. 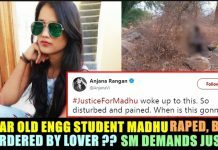 The producer who expressed his disappointment on the trailer of 90ml trailer said that these types of films are curse for Tamil cinema. 90 ml’s trailer which is featuring Oviya, the BIGG BOSS fame, is filled with adult based dialogues and gestures from the lead ladies of the film. Creating a big time quarrel, the trailer has already reached 8 lakh views overnight in youtube. 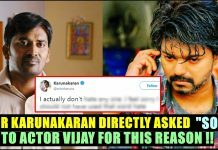 As soon as this tweet of Dhananjayan surfaced online users came up with many contradictory statements. 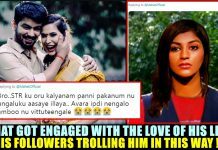 But a separate set of fans went through his timeline and came up with a tweet of Dhananjayan which he posted during the release of “Iruttu Arayil Murattu Kuthu”, a similar adult horror film featuring Gautham karthick in the lead. Your are no person to question it……. 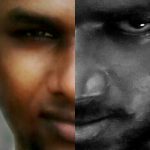 Adhu vera vaai! Idhu naara vaai! Yen sir indha kevalamaana polappu? 90ML trailer is bold in so many ways in terms of content. It has many double entendre dialogues, intimate and steamy shots of the lead actresses making out with their male counterparts. But does them a match to what IAMK and Trisha Ilana Nayanthara had ?? Previous articleThis Physics Professor Found A Way To Keep “Idly” Fresh Even After 3 Or 4 Years !! WOW !! Next articleDoctors Left Forceps Inside Woman’s Stomach While Surgery !! Horrific X-RAY Picture ! !